In our annual reports, you can find out where our money comes from and how we spend it each year on services. 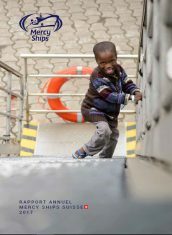 Mercy Ships is funded by an increasing number of committed supporters, including individuals, Rotary clubs, Trusts, schools, churches, and companies. Every franc that Mercy Ships receives is complemented by over two francs in contributed gifts-in-kind and services. 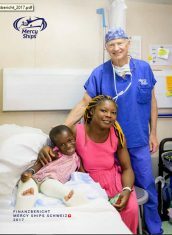 Most significantly, those serving on the ships contribute monthly crew fees and raise their own finances to serve with Mercy Ships. For those reasons, the return on investment for Mercy Ships is nothing less than extraordinary. You can order our annual report in print by contacting our office. We are honoured and grateful for all forms of support and for your commitment to transforming lives in Africa. These are our annual and financial reports, both in French and German. Our annual report is published every year in June.